At age 8, this young man can shoot Glock 17 (9mm) competently and safely. With this kind of examples in front of them, adults who are apprehensive about firearms might just realize that they aren’t difficult to operate properly. It might not be “child’s play”, but it is a sport in which even children can — and do — participate with enjoyment. Kids can quickly learn to use technological tools, like cell phones and computers, and firearms are far less complicated. For safety, adult supervision is necessary, but restricting shooting sports to age 16 or 18 and up as some countries do is counterproductive. Ignorance isn’t bliss. This entry was posted in light/laser, pistol, training, weapon and tagged 9x19, Glock, Viridian. Bookmark the permalink. Oleg, here’s a good read that’s related to the picture. Well, it’s a good read except for the stupid questioning about why the 11yo had access to the handgun. Clay target shooting as a high school sport on the rise in recent years is quite promising. My wife is the coach of our local high school trap team, yes a woman coach of a shooting team. It’s been an incredible experience hanging out with families and kids and firearms. 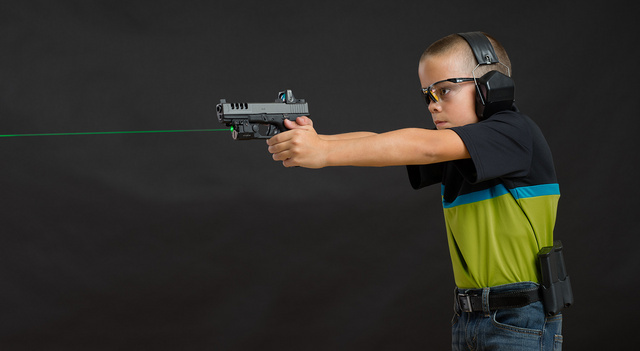 Learning to shoot as a child seems to hardwire the brain for shooting skills. It is retained into adulthood, even without ongoing practice. I’ve seen this in my sisters. A single day learning to shoot in the 6-10 year age group, but they didn’t continue with it due to lack of interest. Years later, they can pick up a gun and outshoot guys that didn’t grow up with it.